Osteoarthritis is the inflammation of bones of the joints that happens due to wear and tear of cartilage. 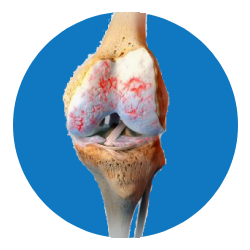 Knee osteoarthritis is often a progressive and irreversible degenerative process. Gradual onset of knee pain, stiffness and swelling are typical symptoms of knee osteoarthritis. Osteoarthritis of knee is more common in older individuals and it may happen in younger individual too. It is a leading cause of disability in people over age 50. Sometimes, it can be hereditary. For others, knee osteoarthritis can result from injury or infection or even from being overweight. The osteoarthritic process is gradual, accompanied by on and off symptoms that eventually worsen over several years. An arthritic knee has thinned, damaged or missing cartilage in the joint. As knee osteoarthritis progresses, the patient may experience diminished range of motion of the knee, or ability to bear their own body weight. Treatment intervention in the initial development stages of osteoarthritis may improve joint preservation, joint integrity and its function in the long-term, or even a lifetime. It can also save you from the debilitating pain and the possible need for joint replacement surgery. The treatment goal is to improve functionality of the knee and control pain. Using supportive devices and orthotics like elastic knee braces or using a cane on the opposite side of the affected knee. Knee arthroplasty – replace the knee joint with an artificial one. Recovery from Knee Replacement surgery requires a long rehabilitation period. If there is no pain relief within 2 to 4 days of rest, then the individual should seek medical attention.